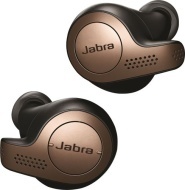 alaTest has collected and analyzed 4 reviews of Jabra Elite 65t. The average rating for this product is 3.2/5, compared to an average rating of 4.2/5 for other Headphones for all reviews. Reviewers are impressed by the size and comfort. The usability and price are also mentioned favorably. On average, users rate this product 64/100.